Congratulations to this month’s Free Prize Draw winner Elieen. You have won a free distance reading – I have sent you details of how to claim by email. If you want to sign up for this prize draw send me an email with your request to be included in the prize draw. I pick one person each month to receive a reading. I will occasionally send an email to the list updating you of my services etc.. 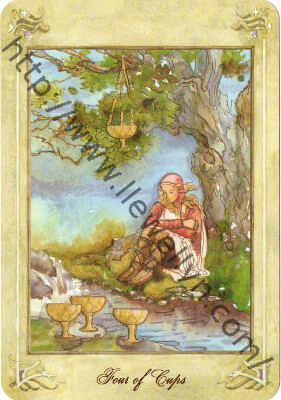 This month’s single card reading is from the Llewellyn deck and is the 4 cups. It shows a young woman looking at the ground sitting at the bottom of a old tree. Three cups in front of her and 1 hanging from the tree. There is a river flowing in front of her the 3 cups are on the other side of the river. The three cups on the other side of the river are like those things we kind of want but have given up trying to get they are not far away but out of reach enough and we feel tired and exhausted. We hold ourselves inwards and don’t take any further steps out into the world – we are safe in so many ways – just not very happy. This card is very much about being in a place of safety and this safe place becoming a trap. We start to fear risking something new as where we are is OK. OK, but not ideal. We don’t notice the passing of time in the form f the river, nor do we see that the old and wise wisdom of the tree holds something for us – something we can reach for if we simply stand up and see it. There is no hurry in a sense – the opportunity is not about to be taken away so we can allow ourselves to sit for as long as it takes us to pluck up the courage to see things from another perspective and take the opportunities that this brings. However if we sit forever then forever time ticks on and we don’t really feel fulfilled or excited by life – it becomes like simply existing. So in June it is time to start asking yourself whether the comfort you feel is actually worth risking in order to feel more joy, excitement and passion in life. Is there a risk you need to take that actually honours yourself more. Sometimes we see this in our relationships – particularly long term ones – where we are happy enough together that we let little things go and say “its ok I didn’t get to do what I wanted on this occasion – my partner is happy – next time!” But we have said this over and over through the years and it builds up – did the ‘what you wanted’ actually happen or has it become a pattern to avoid conflict by letting the other get what they want? It is also seen in our relationships with our children when we sacrifice our needs for theirs and forget to make time for our own. Ultimately it leads us to feel down and sometimes resentful and often we don’t even know why. So take the opportunity in June to do what you want – stand for yourself, allow a little conflict in your relationships in order to honour yourself as much as you have the other. You may find you have been wanting to meet new people but the routines of being at home have been comforting and tempting you out of taking the risk to reach out to new people, the nerves of the unknown and what might happen holding you back. Allow the wisdom of the tree that offers you an opportunity – perhaps something from the past you would like to rekindle, perhaps something new that is very solid and actually reliable. All you need to do is stand up and look around to find the opportunity. It is not hidden, except by your assumption it can’t be possible for you. Allow all possibilities and take that first small risky step – things can seem much brighter once you have seen how you have held yourself back. In business and the work arena the story is the same – perhaps you are thinking of leaving your job but haven’t yet asked for what you ideally want from your current position. Perhaps you feel there is nothing out there. Allow yourself to have an open mind – what if what you want is just there waiting for you? perhaps your boss is happy to give you the pay rise, perhaps the combination of hours and responsibilities is actually completely possible once you ask. Take that step and make it happen – give the universe a chance to offer you exactly what you want. The trunk of the tree supports you – your own wisdom and experience gained over the years supports you, actually you have created this opportunity yourself you simply need to take it and recognise things are different now to when you made the decision to be happy where you are, as the times change so do the potentials. Emotionally you may have been holding back your feelings for fear of where they lead but emotions are not good in a static stable place – they are happier when they flow like the river. So allow your feelings out -it is safe to now and they can flow through you and inform you of your next steps once you hear and release what you have been afraid of feeling. You prevent their stagnation holding you up and you allow your passion a place once again in your life. Often the changes needed are less radical than we fear with this card, simply we need a little courage and some small steps and everything starts to move again. So stand up, trust, go forward, life is offering you just what you need, have courage and faith! Telephone Reading: I found the reading very helpful. Emma is very insightful and made me feel more positive about my future addressing various important issues in a way that doeswn’t make you doubt yourself. I would recommend a telephone reading for someone who needs guidance in various areas in your life.